Founded in 1974 and respected as one of the most trusted brokers in the world, IG has been offering share dealing since 2014, providing traders low costs, quality trading tools, and access to over 9,000 shares across the globe. IG began life as an IG Index back in 1974, primarily as a vehicle for individual retail investors to speculate on the gold price. This was the world’s first financial spread-betting company, and since then IG Index has retained its position as a market leader in this space. IG is a member of the FTSE 250 with a market capitalization of over £3.1 billion. IG is a truly global business, with a physical presence in 14 countries and more than 195,000 active clients. The company has always been at the forefront of innovation, which includes the establishment of the first online trading service back in 1998 and providing the first iPhone trading portal in 2008. In 2014, IG branched out to launch its web-based share-trading service. Its aim was to bring a perceived technological advantage from its spread-betting platform into the online share-trading world. Furthermore, the group also brought broad market access and low commissions and fees. IG clients can deal in over 9,000 shares from across the major global stock exchanges. IG markets offers a simple commissions and fee structure. The commission per trade (stocks, ETFs) is £8 if the number of trades has been 0-9 in the previous month; if more than 10 trades were made the previous month this rate is only £5. The rate is also reduced to £5 per trade for clients that have at least two IG accounts (Share dealing, FSB, CFD or Smart Portfolio). IG charges a quarterly custody fee of £24 per quarter on its share dealing and ISA accounts. Any commissions paid during the quarter are applied against the charge. Clients are exempt if they deal three times or more across any of their IG accounts or if they hold assets of at least £15,000 across their IG Smart Portfolio accounts at the end of the quarter. Overall, IG’s share-dealing rates are less expensive than most of its closest competitors. The IG trading platform and tools on offer are among the extremely impressive features of the IG online trading account. The demands and competition from the spread-betting world and the relatively short-term trading strategies employed by the spread-betting community have necessitated the provision of increasingly complex trading platforms and trading tools. IG has managed to transition its award-winning spread-betting platform across to its online stock-trading provision, which allows for an impressive user experience, particularly compared to long-established competition in the online stockbroker space. The technical analysis offering is by far the most impressive compared to the competition in the online stockbroking arena. From the technical analysis side, pop-up charts allow for 21 technical indicators to be accessed on the chart, all of which have numerous parameters that can be adjusted. Furthermore, nine drawing tools are available, including trend lines and Fibonacci retracements and extensions, which can be customized. Calendar events can be added to the chart and the layout can be customized and saved (along with the overall platform layout). The technical analysis offering is by far the most impressive compared to the competition in the online stockbroking arena. There are also many trading tools available, which are not commonly offered on competitor platforms. 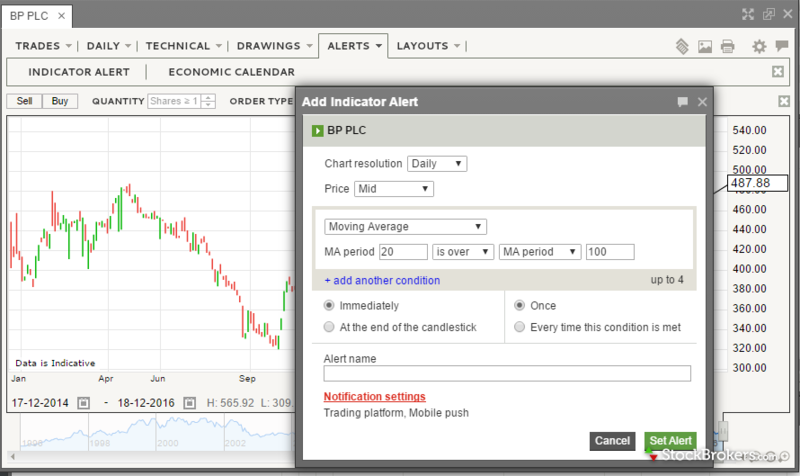 Not only can price alerts be set, but these can be set on various indicators and can be customized further. Economic calendar alerts are also available. The alerts can be displayed on the trading platform or can be received via mobile push or email. Compared to competitor platforms, the IG platform is far more flexible in dealing with current orders, previous trades, and open positions. New orders can be executed straight from the chart, whilst open positions and working orders can be viewed on the chart, rather than within the account section. Finally, the IG client also has access to third-party technical analysis research and trading tools provided by Auto Chartist and Trading Central. Auto Chartist is a provider of automated trading signals and charting patterns, whilst Trading Central is a technical analysis report provider. All in all, the IG charting platform is our top pick in 2017. IG has mobile apps for Android devices and iPhone. Furthermore, there is also a dedicated iPad app, IG Trading. IG also has a separate education app under the moniker IG Academy. The IG Trading apps are user-friendly and offer many of the tools available on the desktop trading platform. Also, watch lists, and alerts can all be managed from your device and synchronized with the desktop version. We were particularly impressed with another great extra, which is direct access to the IG Community. This allows for discussion with other traders and is a great way to keep up with data and share ideas on a mobile application. Although there is still plenty of room for more in-depth fundamental and financial research, the broader macroeconomic provision, technical analysis research, and Market Screener is strong. We have mixed feelings about the research provided by IG. Its offering of financial and fundamental research on individual stocks doesn’t come close to matching that offered by established competitors in the online trading world such as Barclays Stockbrokers and Interactive Investor. This is primarily a consequence of the individual share-trading space being relatively new to the company. However, the macro fundamentals and technical analysis that come from the spread-betting side of the business are impressive and places IG in a very competitive position. From the IG share-dealing platform, click on any stock or ETF and a separate window will open with an initial overview page. This comprises a technical analysis/charting section, which is probably the best charting package available amongst our reviewed brokers. We will look at this in more detail in the Platform & Tools section below. Although the fundamentals and financials section is less impressive than that offered by more established competitors, there is still more than adequate information for clients to easily access topline data. 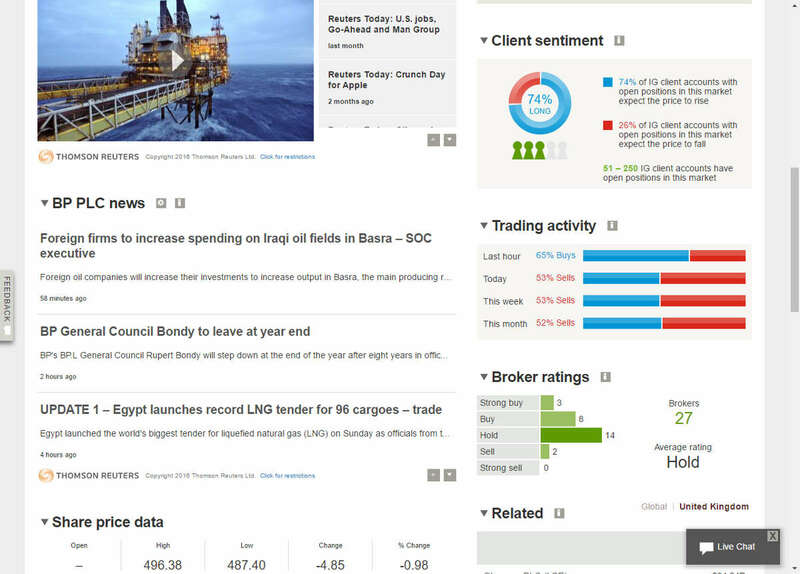 Furthermore, IG offers trading activity data by its clients and also broker ratings. Alongside the technical analysis section we review below, other positive research features are the Market Screener and the abundance of broader, macroeconomic research. This research is presented in multiple media, which makes the user experience particularly satisfying. 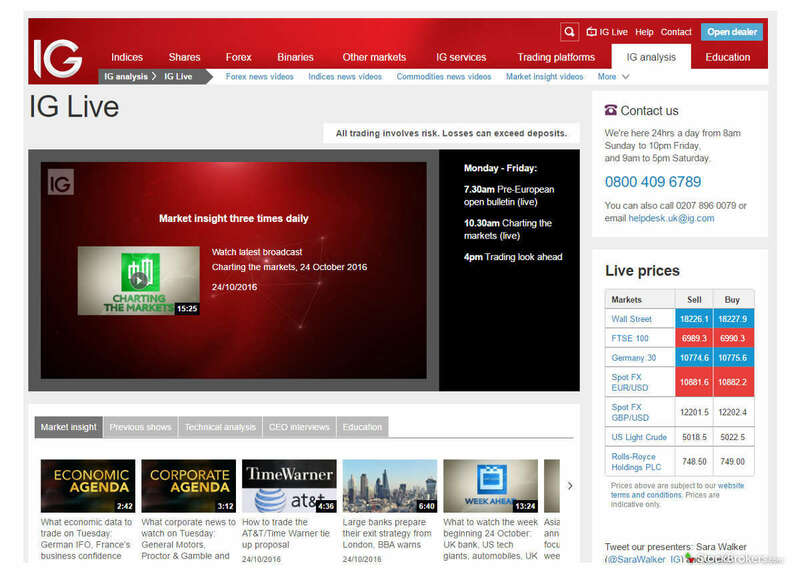 IG Live is a video presented three times a day – at 7.30 am, 10.30 am and at 4.00 pm – and offers a pre-open bulletin, live charting analysis, and a look ahead. There are also regular interviews with CEOs, which are available in an extensive video library also featuring market insights, technical analysis, and broader education. There are also sections for Trade of the Week, The Week Ahead, and Morning Call, all of which can be delivered via regular email alerts. Finally, in the research space, we would like to highlight the Market Screener, which allows traders to screen individual stocks by 28 selected fundamentals (market cap, dividend yield, return on investment, etc.) by 25 different countries, 26 indexes, and 10 sectors. Once the screening variables have been chosen and the parameters set, the screened stocks can then be ordered by the various parameters. Screens can be saved, and there are also some pre-populated saved screens from IG analysts. This is an invaluable tool for any trader who has a strong financial/fundamental leaning in their analysis. Although there is still plenty of room for more in-depth fundamental and financial research from both third-party providers and IG, the broader macroeconomic provision, technical analysis research, and Market Screener nevertheless still leave IG in a strong position, even with its deficits in the research area. Although very much focused on a broader, macroeconomic trading outlook, rather than focusing on individual stocks or microeconomic analysis, IG’s provision of educational content is impressive. There is a separate IG Academy app available to download, which provides step-by-step courses on basic to intermediate term trading. This educational offering begins with courses as simple as “Introducing the financial markets” and “The basics of technical analysis” through to “Planning and risk management.” These are all broken down via modules, and you can track the courses and modules you have covered. New clients are offered an individual, personalised walk through the trading platform, and are shown how to place a trade. There are also many in-person seminars and webinars available, with a regular 30- minute webinar every Monday as well as educational videos arranged by topic. IG offers an abundance of online broking experience as the world’s first financial spread-betting company, operating since 1974. From this experience, IG offers a host of extremely attractive features to the IG online stock trading space, including a market-leading charting package, extremely flexible trading tools, the impressive Market Screener, and a user-friendly mobile trading app. However, given the relatively new foray into the world of online share trading, the financial/ fundamental analysis of individual stocks lacks depth. Unfortunately, the lack of depth in product offerings and the absence of fund investment options, diminishes the overall IG package. If you are looking for a trading platform to simply trade individual stocks and ETFs from a basic-intermediate fundamental level (alongside some spread betting), then IG will appeal to you. For more experienced traders who want to access comprehensive company research and fundamentals or for investors looking for a broader spectrum of investing options, IG should improve its offerings. Drawbacks aside, IG is worth close consideration overall thanks to its outstanding trader tools and ultra-competitive commissions. Select one or more of these brokers to compare against IG Group. Trading Fees - The online share dealing charge is determined by the number of deals placed in the previous calendar month (including UK or overseas shares, ETFs, gilts, corporate bonds, VCTs and investment trusts). Like many brokers, IG charges a quarterly custody fee. Applicable to share dealing and ISA accounts, IG charges a flat fee administration charge of £22.5 per quarter. Any commissions paid during the quarter are applied against the charge. Also, clients are exempt if they deal three or more times across any of their IG accounts or if they hold assets of at least £15,000 across their IG Smart Portfolio accounts at the end of the quarter. IG SIPPs are administered by James Hay, under the James Hay Modular iPlan. There is no IG charge for adding a SIPP, but you pay an annual fee of £195 to James Hay. Find out how IG Group stacks up against other brokers.